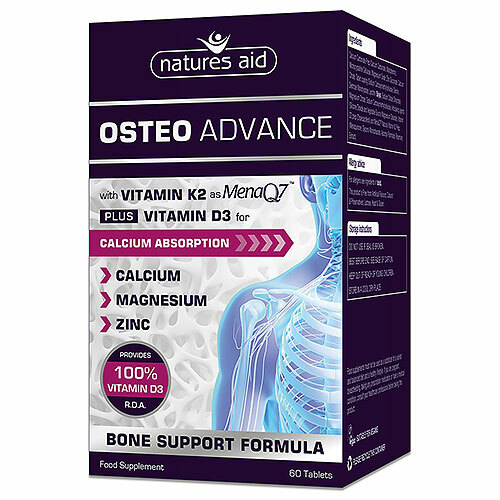 Osteo Advance provides Calcium, Magnesium, Zinc & Vitamin K2 which contribute to the maintenance of normal bones, along with high levels of Vitamin D3 which contributes to the maintenance of normal bones and the normal absorption of calcium. Calcium Carbonate Prep (Calcium Carbonate, Maltodextrin), Microcrystalline Cellulose, Magnesium Oxide, Zinc Gluconate, Calcium Citrate, Tablet coating (Sodium Carboxymethylcellulose, Dextrin, Dextrose Monohydrate, Lecithin (Soya), Sodium Citrate Dihydrate), Magnesium Citrate, Sodium Carboxymethylcellulose, Anticaking agents (Silicone Dioxide and Vegetable Source Magnesium Stearate), Vitamin D3 prep (Cholecalciferol) and MenaQ7® Natural Vitamin K2 Prep. (Menaquinone,Glycerol Monostearate, Ascorbyl Palmitate, Rosemary extract). This supplement should be avoided by people with hyperparathyroidism, kidney disease and ulcers unless otherwise advised by a GP. Calcium supplements may cause constipation, wind and bloating in some individuals although this is an unusual occurrence. Magnesium may cause diarrhoea in some cases. MenaQ7® will not cause “blood thickening” or “hypercoagulation” due to the fact that it activates the proteins used by the liver for clotting, rather than affecting them directly. However, patients undergoing anticoagulant treatment with coumarin or warfarin must contact their G.P. prior to using vitamin K2 supplements and should only do so under their supervision. Below are reviews of Natures Aid Osteo Advance - 60 Tablets by bodykind customers. If you have tried this product we'd love to hear what you think so please leave a review.